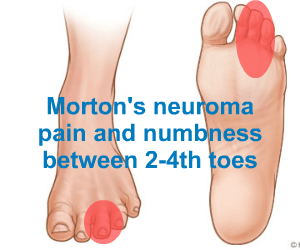 Morton's neuroma is a more specific problem to metatarsalgia and involves pain and numbness in the areas between the 2nd-3rd or 3rd-4th toes. 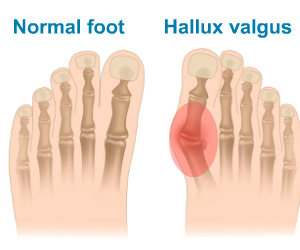 Hallux valgus is the term given to what is most commonly known as bunions. In this condition the big toe joint is often inflamed and painful. The big toe is deviated to varying degrees towards the 2nd toe with the 1st MTP joint more pronounced. There are a number of reasons for hallux valgus such as over pronation and biomechanical issues. Footwear can also become problematic as wider footwear is needed to accomodate the "bunion". 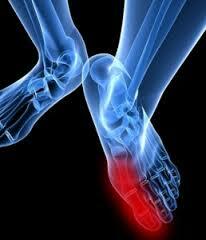 Gor more information on how to diagnose manage and treat hallux valgus or bunions click here. Hallux limitus is where there are issues with the motion of the 1st toe and it is reduced impacting on it's ability to move upwards (dorsiflex) when walking. The big toe has an extremely important function in walking to aid in stability and propulsion when pushing off from one foot to the next.